This past weekend has been a little crazy to say the least. My parents went out of town last week for a wedding and asked me if I would go to their house to stay with my younger siblings. There is a huge gap between me and my youngest sibling… almost 15 years. Crazy huh?! It is nuts because our lives are on such different pages, but my youngest siblings are some of my favorite people. Needless to say this weekend was fun but busy, too. During the weekend, I had my youngest sister come and help me in the kitchen and these cookies were born. We opened up our Grandma’s cookbook and saw a recipe for Carrot Cake Cookies. Seeing the ingredients, I immediately wanted to change it up a bit and that is where the “Tropical” part kicks in. We added some crushed pineapple, not only for flavor but to make these cookies moist and soft. They turned out incredible and my whole family enjoyed them! Nikki these sound so delish! I was recently playing around with some pineapple + carrot recipes and the smell alone in my house was so good. Must try your cookies! I am a carrot cake fanatic but... have never actually made one myself! Since I don't have a reason to make an extravagant carrot cake, I think these cookies look much more approachable. I love the flavor combination Nikki! You never cease to amaze me. :) I LOVE IT! 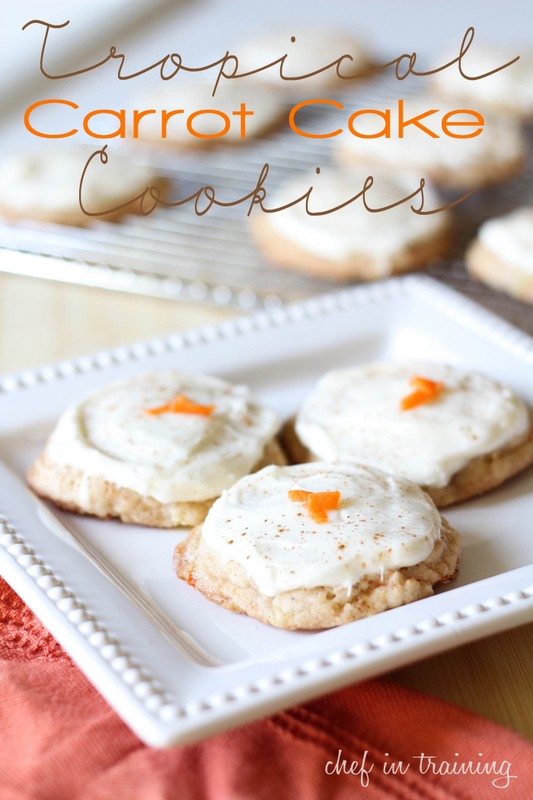 I am totally baking carrot cake cookies in the oven right now! Eek, I LOVE your tropical addition--that sounds fantastic and I wish I would have thought to add crushed pineapple in them. My hubby loves carrot cake - it is his favorite. So won't he be so excited if I made these cookies for him Thanks for helping me score bonus points ;-) I too have younger siblings - youngest is 17 years age difference- makes for fun family get togethers. If I ever get around to hosting that tropical-themed party I'm always thinking about, these will be first on the dessert menu. Thanks so much for sharing!